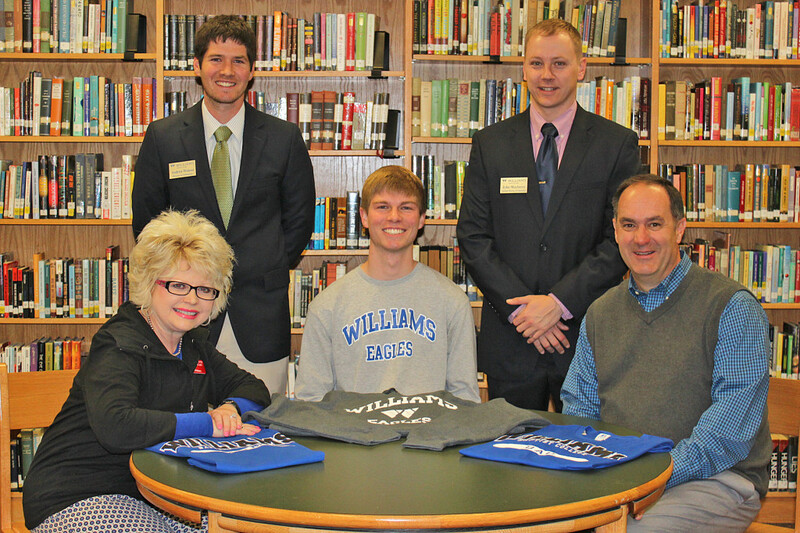 Collin Whitney, a senior at Searcy High School, has been awarded the Williams Baptist College Trustee Scholarship. The future Christian ministries major is the son of Brian and Jana Whitney of Searcy. The Williams Trustee Scholarship is awarded to at least one applicant each year and covers tuition, room and board. This four-year scholarship is given to a freshman with a composite score of 30 or higher on the ACT and a minimum grade point average of 3.5. Whitney said choosing WBC just seemed like the natural thing to do. “After visiting the campus, it seemed like all the chips fell into the right place. I really thrive in a community-like atmosphere and after receiving the scholarship, going to Williams was just affirmed as a sign of God’s will,” he noted. Photo: WBC’s Director of Admissions, Andrew Watson (back left), and Assistant Director of Admissions, John Mayberry (back right), pose with Collin Whitney (middle), his mother, Jana Whitney and father, Brian Whitney, at a ceremony held at Searcy High School.